We welcome you to Christ Church Cathedral, Lisburn whether you come as a tourist, as a visitor or simply seeking a peaceful place for prayer. 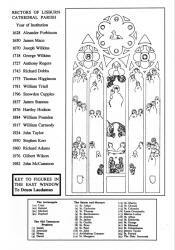 There has been a Christian church on this site for over 350 years and in this booklet we hope to tell you something of its past and guide you to some of the interesting parts of the building. We also hope that you will sense that the Cathedral is a living church - where part of the Body of Christ meets for worship - not simply another historic building. 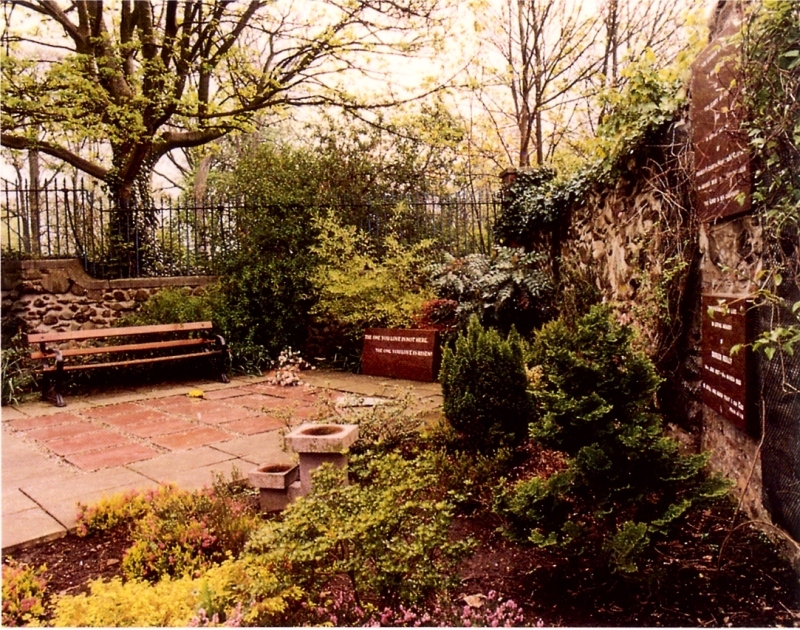 The church of St Thomas, founded on this site in 1623, was a Chapel-of-ease for the castle which stood in what is now Castle Gardens park beside the Cathedral. As the settlement around the castle grew, St Thomas' Church served as a focus for Christian worship in this area. Although the castle is no longer to be seen, the present Cathedral continues to provide a focus for Christian worship and ministry at the centre of the original settlement which has become the present busy provincial town. The interior has changed also by the addition of the gallery, and rearrangement of the chancel area. 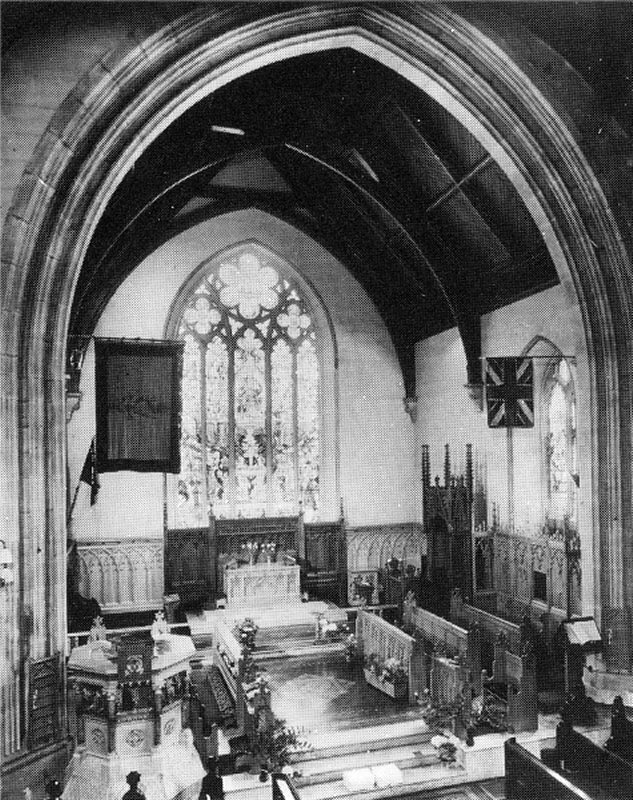 When the present chancel was constructed more than a century ago it created space for choir stalls and sanctury; this area was again changed in recent years by moving the choir seating into the main body of the building, making it possible to extend the communion rail. With increased space in the chancel, it is possible to have many differing arrangements of musicians and singers for some of the newer forms of service like praise services and family services. 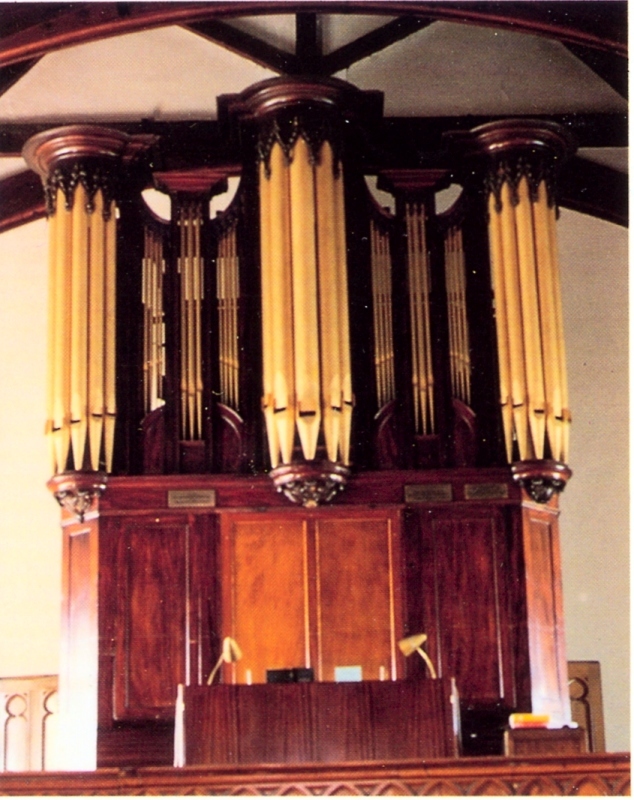 Although the building has seen changes in the form of worship and the contribution of music, the central purpose of the Cathedral has not changed: it endures as a place for the worship of the living God and as a beacon for Christian faith in this town and district. About the year 1609, a Welsh officer, Sir Fluke Conway, settled in Lisnagarvey (as the district was then called) and built, or rebuilt, a castle on the highest point overlooking the river Lagan in what is now Castle Gardens park. In 1623 he constructed a church, dedicated to St Thomas, on the site of the present Cathedral as a chapel-of-ease for the castle. St Thomas' Church was much smaller than the present cathedral but little is known of its architecture. As the settlement of Lisnagarvey grew around the castle the church began to be used as a place of worship for the townspeople. 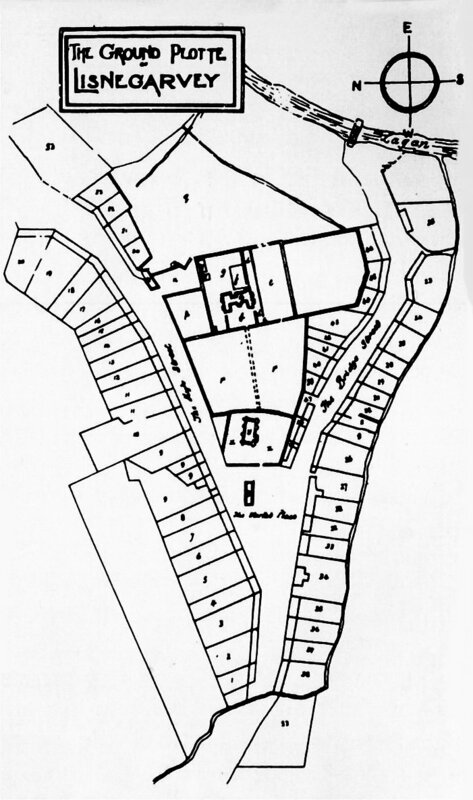 The earliest map of the settlement shows houses fronting on to Bridge Street and the present Castle Street forming the market place with the church occupying the area between the converging streets. October and November St Thomas' Church was destroyed . The rebels led by Sir Con Magennis were defeated at Lisburn, thereby protecting the towns of Belfast and Carrickfergus. 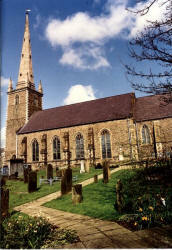 Although civil conflict continued in Ireland for eight years with hostilities in other towns, there was comparative peace in Lisburn and the church was reconstructed. 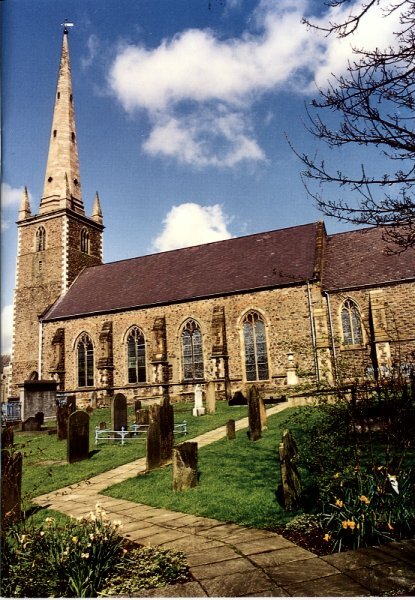 In 1662, while Jeremy Taylor was bishop of Down and Connor, the church of Lisburn was granted a charter by Charles II as the Cathedral of the United Diocese. There is no record of major construction associated with its Cathedral status, although the vestry book records that sums of money were raised for the repair and enlargement of the church and churchyard. In particular, the tower was constructed in 1674, providing access to the original gallery which was erected in the same year. The building was in good repair and well cared for in 1697 when the first of the Huguenot families began to settle in the town. Although the Huguenots established their own church in Castle Street they were associated with the Cathedral and several members of the original families were buried in the Cathedral churchyard. In the more settled period that followed the Williamite wars the district was prospering when, in April 1707, the town of Lisburn and the church and castle were destroyed in a disastrous fire. There seemed to be no urgency to rebuild the castle for the defence of the town but in the following year, on 20th August 1708, "the foundation of the new Church of Lisburn began to be laid". Construction of the present building, the third to stand upon the site, continued for several years and was still in progress in 1714. In its original form the building was rectangular, extending to the east wall where the chancel now stands. Some reconditioning of the tower was carried out at this time but the spire was to follow almost a century later. The clock and bell tower were presented by the Marquis of Hertford. The vestry was added in 1727 and is of similar construction to the original rectangular nave. The slim, octagonal spire of cut stone with its base on the tower was constructed between 1804 and 1807 creating the most prominent feature in the middle part of the Lagan valley. 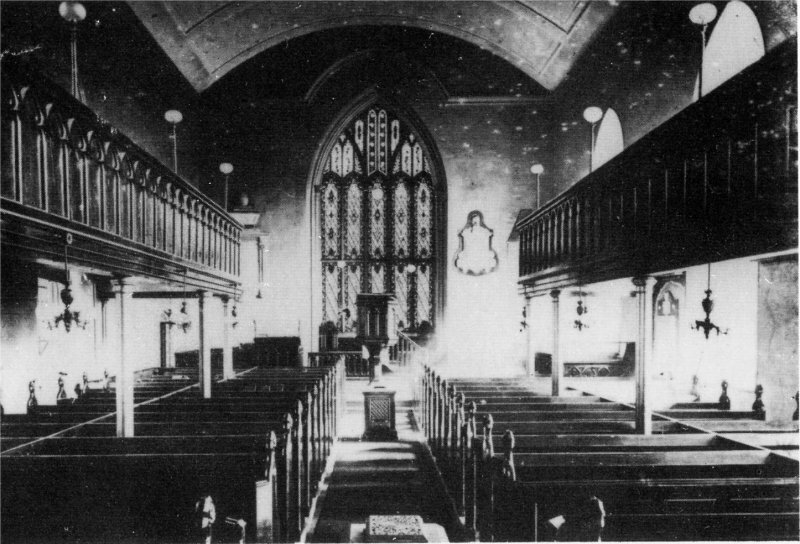 By the time of the earliest photographic record in 1885 the perpendicular east window was still in place, a gallery had been added and the pulpit was in a central position. 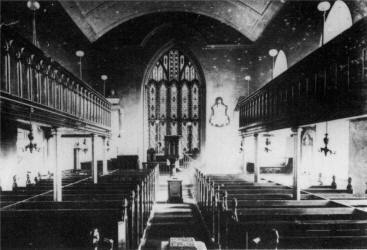 Heating was provided by two stoves in the aisle but the layout of pews and aisles was similar to today. With improving prosperity the Cathedral was ready for enlargement. During the period 1884 - 1917 while Canon Pounden was Rector, the Cathedral was extended in a major way by the addition of the present chancel. Most of the east wall was replaced by a graceful gothic arch in 1889 and substantial buttresses of dressed stone were constructed to reinforce the external walls of the nave. 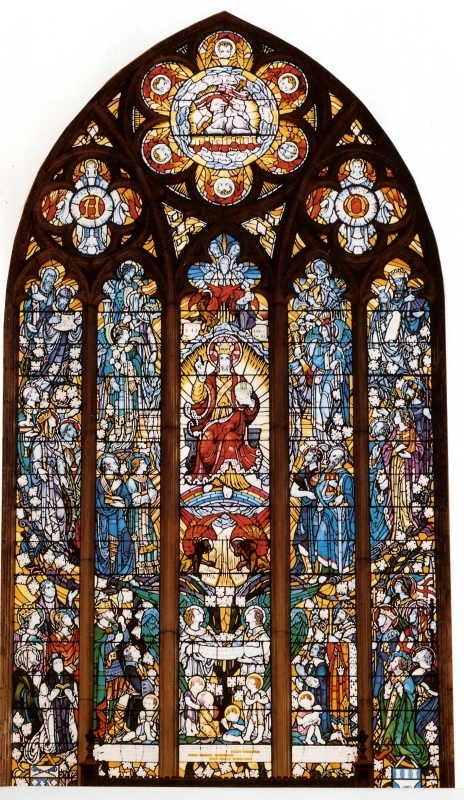 Pictorial windows in memory of Sir Richard Wallace and the Bishops and Rectors were dedicated and in 1890 the Glastonbury chair was presented, choir stalls were located in the chancel and an ornamental stone pulpit positioned at the foot of the chancel steps. In this vigorous period of building the present parish hall was constructed to serve as a Sunday School on a portion of land granted from the adjoining Castle Gardens park. The First World War was a time of great loss for the Cathedral Parish and is commemorated by memorial tablets in the porch. For many years the regimental colours from this conflict were displayed in the chancel. The years between the wars saw considerable new growth as a picture of 102 men comprising the Cathedral Bible class in 1929 bears witness. Fewer lives were lost by servicemen from the parish in the Second World War. 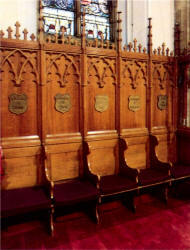 The Chapter Stalls in the Chancel are dedicated to their service. 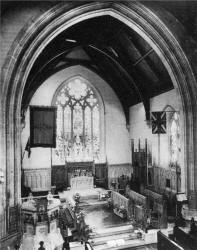 The major post war change to the interior was the dedication in 1950 of the east window depicting Christ in Glory. It was presented by Sir John Milne Barbour. 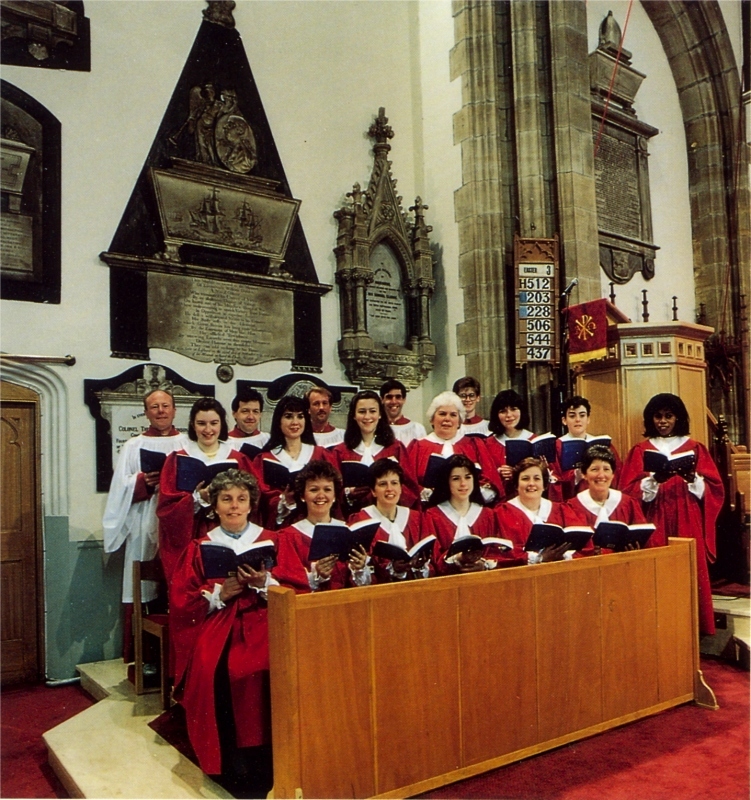 In 1990 the present spacious chancel area was created by moving choir seating to a raised area below the pulpit. The communion rail was extended and new chancel steps in white marble were installed. 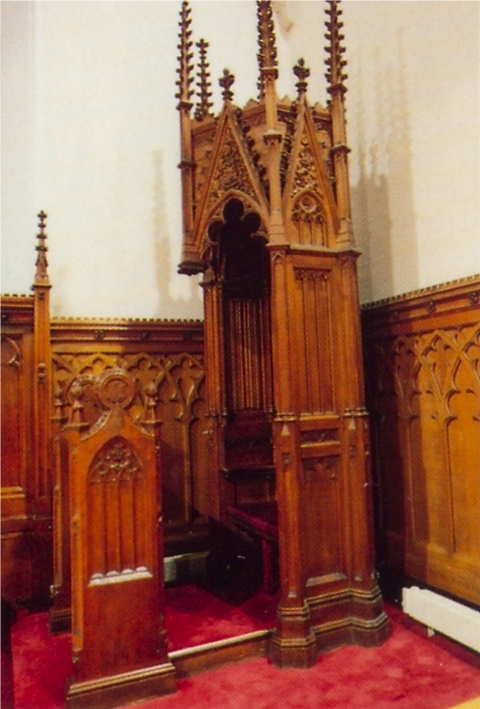 The stone pulpit had become unsound and was replaced. 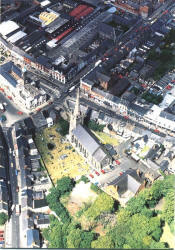 To understand the historical background to the Cathedral in the Diocese of Connor it is necessary to go back several centuries, and to understand that Down and Connor Diocese were in union for 500 years and that Down Cathedral lay in ruins from the suppression of the monasteries in 1541 until 1790. About the year 500 A.D. Aengus MacNisse, a pupil of St. Patrick, is said to have founded the church of Connor and to have been its fist Bishop. 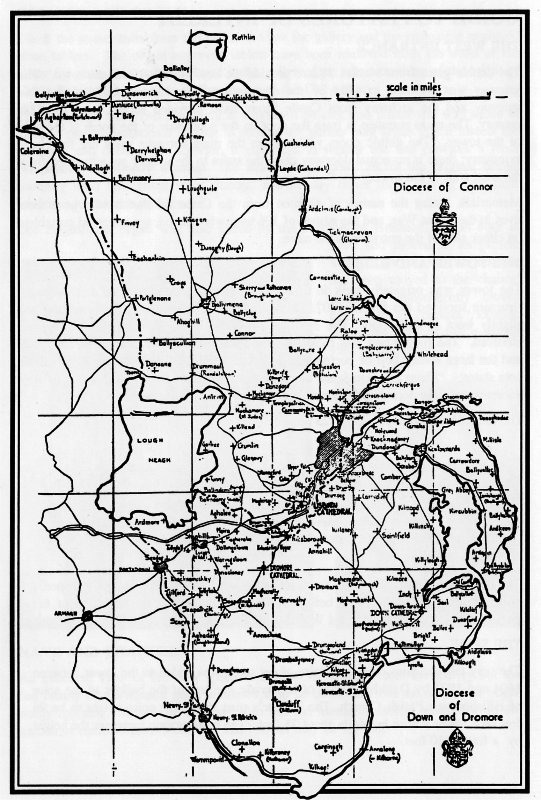 In 1442 the Diocese became a Union with Down and so remained until 1944. In ancient times the Diocese of Connor does not appear to have had a Cathedral or Dean and Chapter. In 1609, however, James I founded a Chapter for St. Saviour, Connor, but apparently no Cathedral was provided for them. 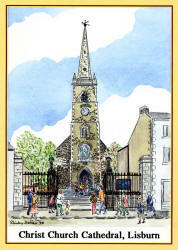 Since 1662 this Chapter has been, and still remains, the Chapter of Lisburn Cathedral. The "Transmiss" of the Charter given by Charles II establishing this church as a Cathedral, is preserved in the Public Records Office in Belfast. "And whereas the Church of Lisburne alias Lisnagarvie, in the county of Antrim and Diocese of Down, being situate near the middle of the dioceses aforesaid; and now united, can more Conveniently serve for a Cathedral Church for the bishopricks aforesaid, we have erected, created, founded, ordained; made, constituted and established the said church of Lisburne, alias Lisnagarvie, and place of the same Church to be for ever hereafter the Episcopal seat of the aforesaid several bishopricks of Down and Connor and to continue for ever in all future times"
However, some years ago a question was raised as to the validity of the Charter granted by Charles II. It was suggested that the instrument had never been made effective and that the Charter had never received the sanction of Parliament, nor was the Royal Seal affixed. It was suggested by some scholars of ecclesiastical history in Ireland that this Church is a Cathedral only in name and by centuries of use. In order to remove all doubts as to the status of our Cathedral the Bishop of Connor, at that time, Bishop Charles King Irwin, introduced a Bill at the General Synod of the Church of Ireland in 1952. This measure recognised Lisbum Cathedral as the Cathedral of the Diocese of Connor, known as the Cathedral of Christ Church, Lisburn. The Diocese of Connor covers approximately the area of County Antrim including the part of Belfast to the north of the river Lagan. The double gates from Market Square provide the best visibility from the town. The gateway was widened in 1924 by the demolition of an adjacent building but this gateway and the archway from Castle Street have provided access from the 18th century. The main entrance is from the door on the south side of the porch at the base of the tower. The gothic doors visible from the main entrance gates are for visual symmetry; there is no actual doorway since the stairs to the gallery are supported from the west wall of the tower. Memorials, listing the names of 48 men from the Cathedral Parish who gave their lives in the Great War, and the names of 196 men who served, are engraved on tablets on either side of the entrance to the nave. The tower was originally built in 1674 to provide access to the gallery. Its main structure survived the fire of 1707. The walls are constructed of local stone and are slightly inset at each floor. The clock and bells were a gift from the Marquis of Hertford. The robing bell was recast in 1746, the two small clock bells cast in 1796 and the large tolling bell or curfew bell recast in Dublin in 1861 An early historical note states:- `There is a handsome clock and chimes, likewise a valuable bell of very superior tone, the hour is proclaimed loquaciously with eight tongues"
The curfew is still Ring every night at 9 o'clock' 100 strokes of the large bell being given, and the inhabitants hear now as of yore, the hour chimed, while those in the adjacent surrounding neighbourhood enjoy the same privilege, and in addition have a perspective view of the Cathedral's tall and graceful spire which has stood the blast of many a storm. The bell rope is accessible from the floor of the west entrance porch and is expertly pulled to ring the tolling bell before morning worship, but the sounding of the curfew ceased during the Second World War. Climb the stone stairs from the porch to view the gallery and the remaining engraved stone tablets. The oldest engraved tablets have been removed from the walls of the tower for protection and are placed in the gallery. One tells something of the origin of Castle Robin dating back to the beginning of the 17th century. The gallery of the present building is supported on cast iron pillars and was added in 1824 to provide additional seating. Although the purists may argue that it bisects the windows and darkens the interior, it continues in regular use and provides a fresh perspective on Sunday worship. The straight back pews are of the original design Formerly used throughout the Cathedral and display rather more carving than their modern counterparts in the nave. 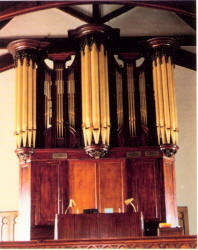 The magnificent organ was also gifted by the Marquis of Hertford. It was built in 1790 and moved to its present location in 1834. 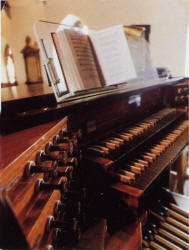 The console has been moved to the chancel area and subsequently moved back to its present location where the organist has a distant view of the. 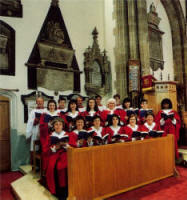 choir. An excellent view of the now spacious chancel is obtained from the gallery but the full beauty of the stained glass windows is to be observed from the nave on a bright sunny morning. It is from the nave also that the memorial tablets referred to in the garden of remembrance section of this booklet may be viewed. Windows on the south wall of the chancel and on the south wall of the nave are memorials to Sir Richard Wallace (1818-1870) Sir Richard was a great benefactor of Lisburn and his collection of pictures and works of art is famous as the "Wallace Collection". 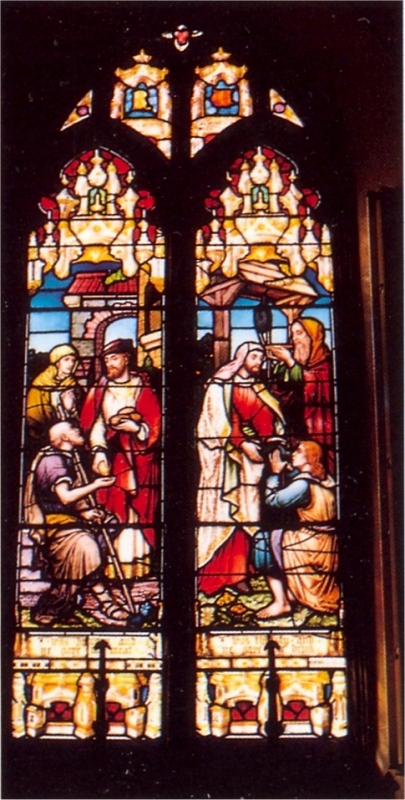 One of the memorial windows was erected by public subscription and the other by Lady Wallace. 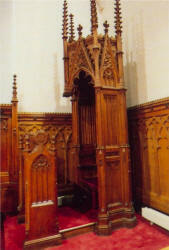 The bishop's throne, dedicated in 1893 and the chapter stalls are located in the chancel. The chapter stalls represent old ecclesiastical centres in the Diocese of Connor and districts in County Antrim. 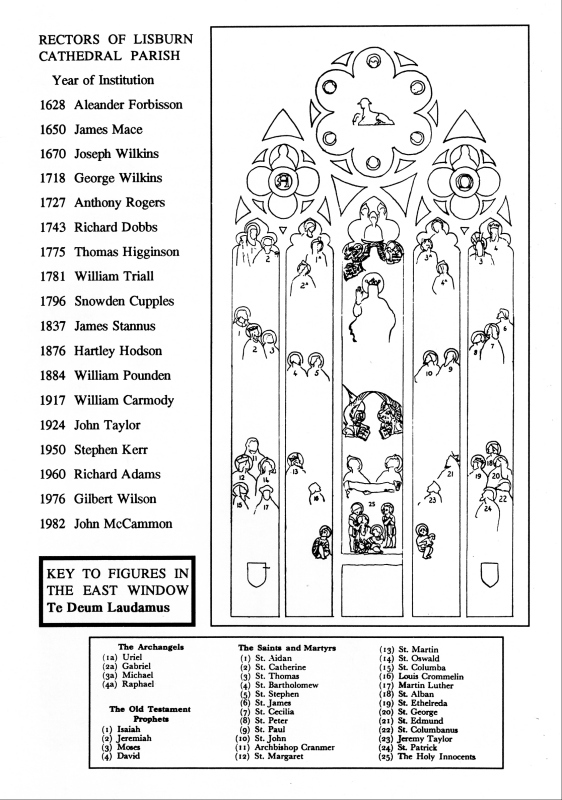 The late Sir John Milne Barbour presented the East Window in 1950 in memory of his wife Eliza Barbour and his son John Milne Barbour who died in an aviation accident in 1937. A key to the figures is given inside the back cover. If you have visited the Cathedral on a weekday it may be difficult to visualise it in use for a variety of services of praise and worship. The illustrations on these pages show something of the body of people gathered to glorify God in both traditional and contemporary forms of worship. Celebration of the Holy Communion has a central place in the monthly cycle of Sunday services. Other types of worship include Family Service, Praise Service, and Healing Service. A robed choir leads the praise in the main Sunday morning and evening services. 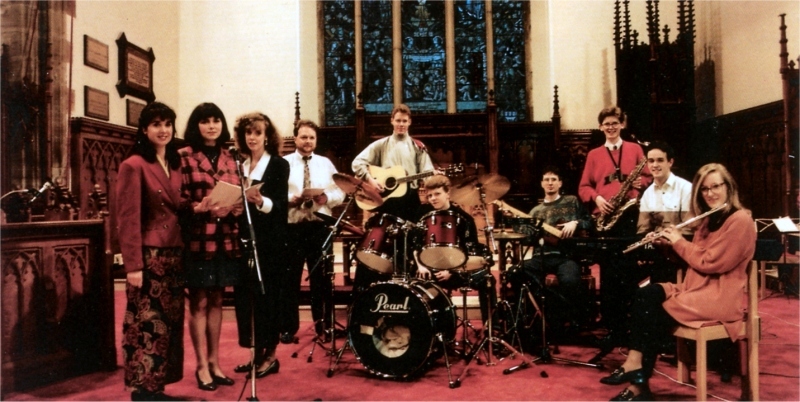 Rearrangement of the Chancel area in 1990 provided space for more members of the church to participate in leadership of praise and prayer. It is now possible to seat a group of musicians with a variety of instruments "making a joyful noise unto the Lord" and this is often arranged for Family Services and Praise Services. A modern sound amplification system ensures that the services can be clearly heard in every part of the building. The system is sufficiently flexible to allow for the varied uses required for instrumental groups and drama. We look upon the Church as being like a garden, which is alive and growing, requiring pnm�hg in some places to encourage new growth. The illustrations therefore represent only a snapshot in time, as the seasons change. The central message of the Gospel of Jesus Christ is unchanging, but as society changes the way we worship changes - reflecting new life and growth. "GO, and Teach all Nations"
From its origin the church on this site has existed to extend the Kingdom of God in the town of Lisburn and to equip its members to carry the Christian message to other parts of the country and the world. In the second half of the 20th century, ten men from Lisburn Cathedral have trained for the ordained ministry and have been called to serve in parishes in Ireland, England and further afield. The Cathedral continues to encourage lay people to Christian service at home and overseas. Men and women from the Parish have undertaken long term missionary service in Africa and south America, and the Cathedral has maintained links with Anglican Churches in east Africa and Peru into the present decade. Externally, the Cathedral Hall is little changed since it was constructed to house the Sunday School in 1884. It has been used in many ways over the years, including a period of wartime service when the Sunday School was held in the Cathedral. Major redevelopment of the interior was carried out in 1989 to provide extra meeting rooms and an upstair lounge without changing the exterior character of the original building. The main hall still serves its original purpose as a Sunday School and accommodates a variety of weekday activities. There is a spacious and well organised kitchen making it possible to cater for parish lunches or larger functions. The upstair meeting rooms enable large and small groups to meet in comfortable surroundings. 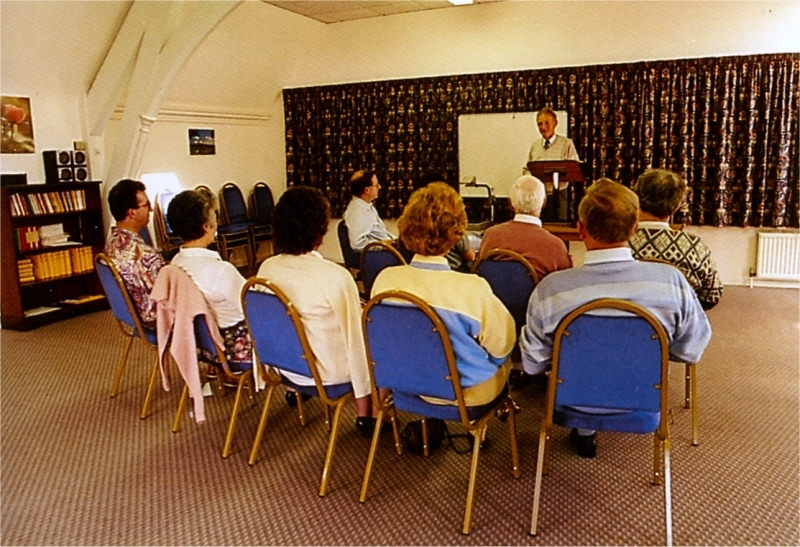 In its new form the Cathedral Hall continues to serve as a place for teaching, counselling, Christian fellowship and other activities for people of all ages. The main function of any church is to help individuals come to experience for themselves a living personal faith in the One who is Lord of the Church, Jesus Christ. On this page, one of the Cathedral's recent churchwardens relates his experience. When I shared how I was feeling with my wife, I found that she was having the same kind of thoughts as myself. Over the years we had stopped going to church (although we ensured that our children went to Sunday School) but now we decided to start attending our parish church regularly. A couple we were friendly with gave us a Bible and I started to read it. 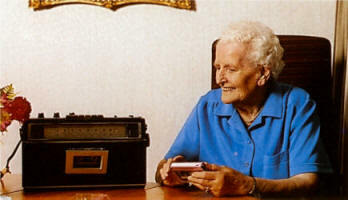 Ihad difficulty with the Old Testament but when I started to read the Gospels I found that I could not read enough. On reading John 3.3 I realised that I needed to be born again like Nicodemus. One Sunday night in 19801 knelt down at the side of my bed and asked the Lord to show me how I could be born again. Nothing happened, and I went to bed downhearted, but later that night I was awakened from sleep and felt God speaking to me. I gave my life to Jesus at that moment and invited Him into my heart. I fell asleep again and later I told my wife what had happened She said nothing at that point , but about three weeks later the also gave her life to Jesus. I presently discovered a new way of life as I joined in fellowship with other believers in the Cathedral and progressed in my Christian discipleship. The Lord is a loving Saviour; He has not promised His followers a life which is a bed of roses, but He does promise that He will see us through every crisis that occurs in our lives and that He will be our faithful Shepherd and Friend. I have proved this to be true in my life. I have experienced the heartache and grief of losing my beloved wife: the died from cancer in March 1986 hi my loneliness and anguish I could see no purpose or reason for living. But God did not abandon me and He carried me through that dark period of my life. Without His love I would never have survived that darkness I feel very humble when I think about His care for me. A whole new and unexpected area of Christian service subsequently opened up for me. I intend to walk with the Lord through this life and I know that He will guide me step by step along the way as 1 keep trusting hi Him. In every generation the Cathedral has had members or clergy who have rendered outstanding service in the community and in the nation. The style of memorial for outstanding service has changed over the years with less prominence now given to murals on the interior of the building. 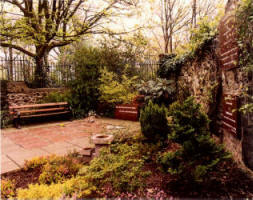 In 1988 a garden of remembrance, for the interment of ashes of parishioners after cremation, was constructed in the south east corner of the churchyard. It was provided by Dr Garry McCartney, in memory of his wife Marilyn. Garry McCartney served as a medical doctor in Lisbum for 22 years before training for the Auxiliary Ministry of the Church of Ireland. He died in 1992. 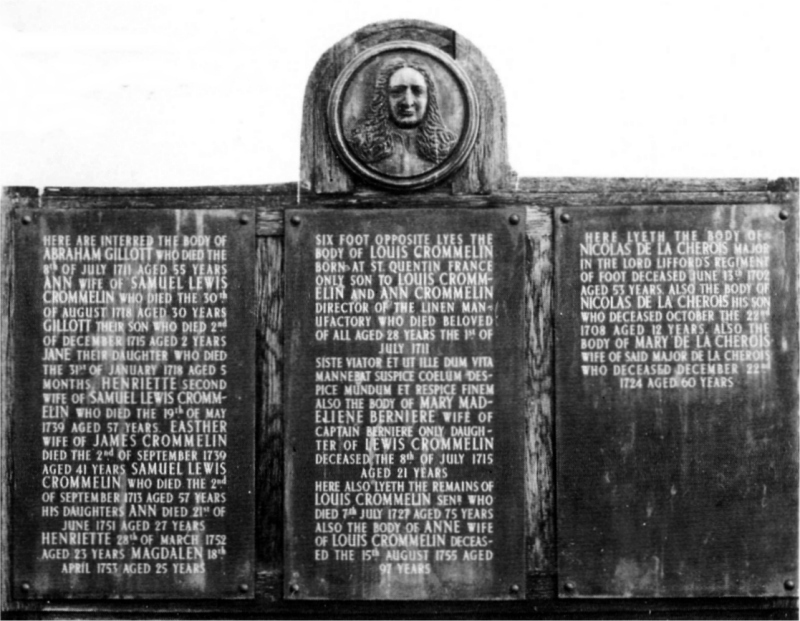 The mural tablets, many of which are grouped on the north wall of the nave near the door through to the vestry, allow a glimpse of the lives and service of many notable citizens of Lisburn from the seventeenth century. Some of the memorials speak for themselves, some require additional explanation. The work of two former Rectors who did much to build up the fabric of the Cathedral is commemorated as well as a famous Bishop. There are also notable soldiers and sailors. A simple brass plate on the wall of the old chancel records the location of the original burial vault which holds two coffins one of which is believed to contain the remains of Sir George Rawdon. 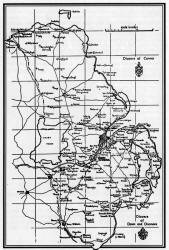 The Rawdons or Roydons were an old Norman family, their ancestor Paulyn Roydon having obtained a grant of the lands from which they derive their name from William the Conqueror. It was Sir George who defeated a rebel army in 1641 at Lisburn. His son Sir Arthur Rawdon was M.P. for Down and was a distinguished soldier. He took part in the defence of Londonderry during the siege. General John Nicholson was born in Dublin, but spent part of his boyhood in Lisburn. His parents were married in the Cathedral. The memorial tablet, on the north wall of the nave, depicts the siege of Delhi in 1857 in which he lost his life. The tablet was erected by his mother and is the work of the great Irish sculptor John Foley. On the north wall of the nave there is a tablet in memory of John Nicholson's brother, Major Charles Johnston Nicholson, and his wife Lizzie Nicholson. Lieutenant William Dobbs, whose memorial is on the north wall of the nave, was the son of Rev Richard Dobbs, Rector of Lisburn 1743-1775. Just after his marriage the lieutenant was staying at the family seat, Castle Dobbs, near Carrickfergus when an American ship Ranger, under the command of Captain Paul Jones, sailed into Belfast Lough. The naval sloop Drake put out to engage the Ranger and Lieutenant Dobbs, sailing on board the King's ship, lost his life in the ensuing battle. There is no mention on the mural tablet of Captain Jones who is now regarded as the father of the United States navy. Tablets on the south wall of the nave record the service of two members of the Johnston-Smyth family which has been associated with the Cathedral for generations:-Major Thomas Roger Johnston-Smyth, killed in action in the South African war in 1900 and Lieutenant Thomas Johnston-Smyth R.N. who died in trying to save his shipmates of the coast of California in 1846. Rev. Anthony Rogers The marble tablet on the south wall of the nave records the work of the Rev. 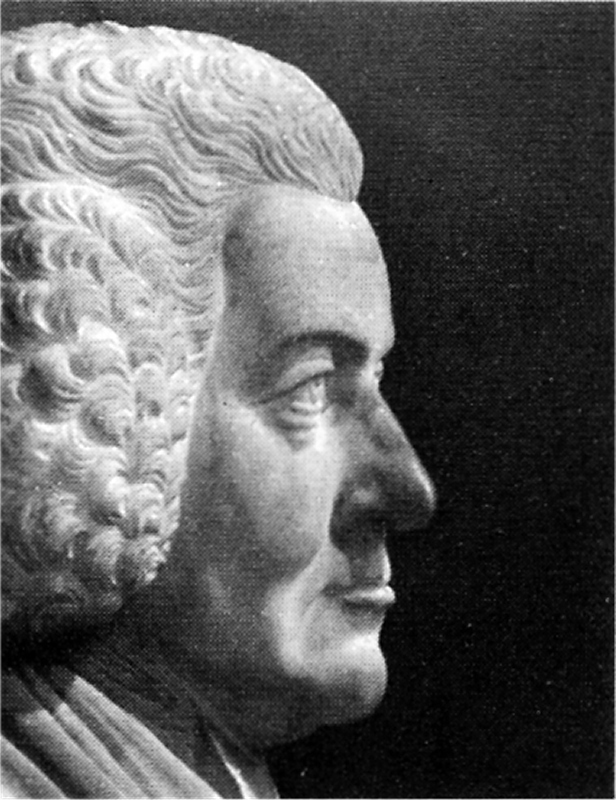 Rogers, Rector of the Cathedral from 1727-1741. The vestry was built during his incumbency, as recorded on a tablet over the north door. During his day parishioners on the County Down side of the River Lagan revolted against payment of the church assessment and the Parish took legal proceedings against them. The life work of Canon W.D. Pounden is commemorated by a simple brass tablet on the north wall of the chancel, erected "by the Primate of all Ireland, the Bishop of the Diocese, and his Brother Clergy". Canon Pounden was Rector from 1884 to 1917. He did great work in this Parish and was beloved by the people of Lisburn. 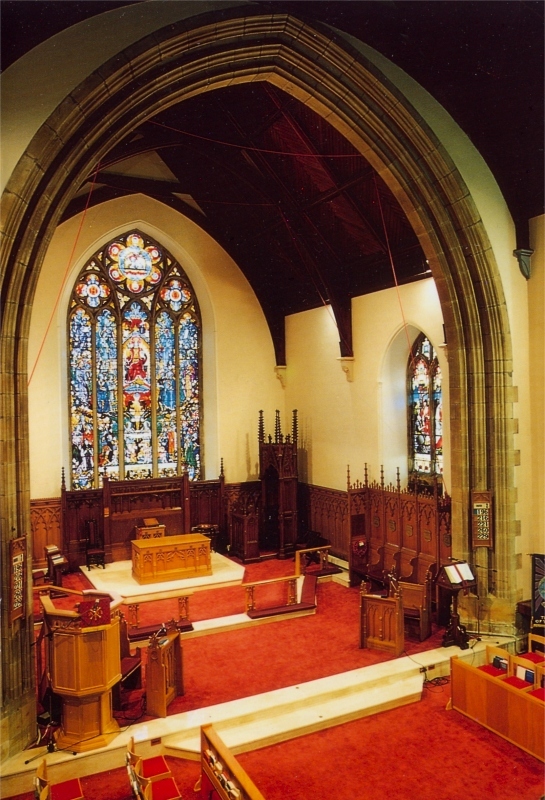 During his incumbency the chancel was constructed, windows in memory of Sir Richard Wallace and the Bishops and Rectors were dedicated and the Parochial Hall was completed. Canon J.S.Taylor was Rector of Lisburn Cathedral from 1924 to 1950. His work is fittingly represented by the photograph below showing the one hundred and two men of his Bible Class grouped outside the Cathedral in 1929. In the year 1697, on the invitation of King William III, Louis Crommelin settled in Lisburn. He was responsible for improvement and organisation of the linen industry in Ulster. He was followed by other Huguenot families and a French settlement grew up around the district. For a time the Huguenots formed a distinct congregation in Lisburn. They worshipped in the French Protestant Church which was on the north side of Castle Street, mid-way between the side entrance to the Cathedral and the Lisburn College. They had their own pastors, and the services were conducted in their own language but they were associated with the Cathedral. In one of the baptismal registers there is a list of twenty-three names of children baptised by the Pastor of the Huguenot community. 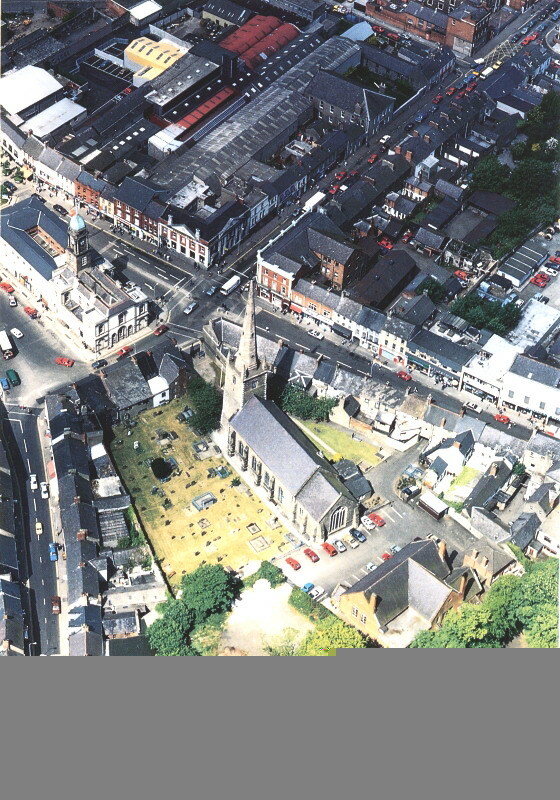 Many of the decendants of Huguenot settlers are living in Lisburn, some families have been in the Cathedral Parish for generations. The Rev. Saumarez Dubourdieu was the last Huguenot chaplain to minister to the French congregation in Lisburn. As the congregation became smaller, and the settlers mingled and intermarried with the local people, the French Church was closed. In course of time the Rev- Dubourdieu became vicar of the Parish of Glenavy and was master of the Classical School of Lisburn for fifty-six years. A memorial tablet to his life and work is on the south wall of the nave. The grave of Louis Crommelin and other members of his family is in the churchyard near the south east boundary. Lisburn Cathedral gratefully acknowledges the reproduction of much of the historical information from the late W. P. Carmody's work: Lisburn Cathedral and its Past Rectors also, the preparation of the cover illustration by Shirley Doran and the colour photographs with the exception of the aerial view, by Alistair Hughes.